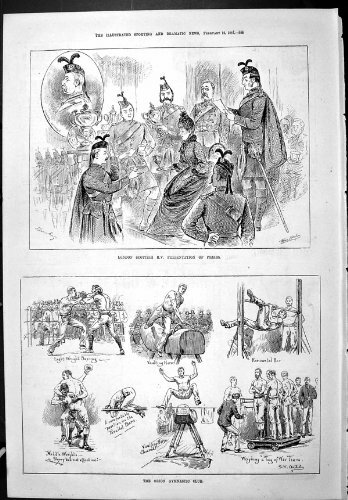 Old Original Antique Victorian Print 1887 London Scottish Orion Gymnastics Boxing Vaulting Tug-Of -War Swain A page taken from our volume of the Illustrated Sporting and Dramatic News volume 2, but only contains pages from September 1886 to March 1887. A high class weekly journal featuring sports, arts, literature music and the drama. Each page is approx 11 x 16 inches (280 x 410)all are genuine antique prints and not modern reproductions. Please note as these papers are very old they are very fragile and brittle so should be handled with care.